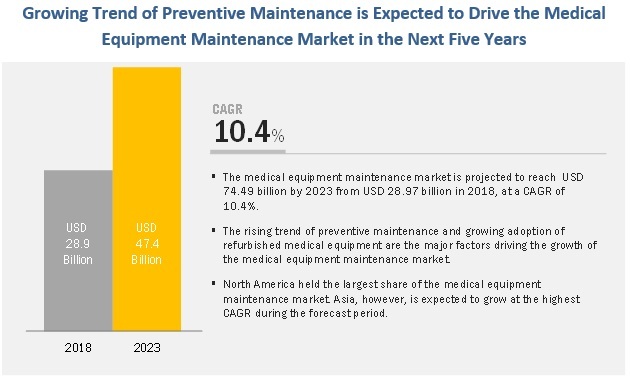 [202 Pages Report] The medical equipment maintenance market is expected to reach USD 47.4 billion by 2023 from USD 28.9 billion in 2018, at a CAGR of 10.4% during the forecast period. The study involved four major activities to estimate the current size of the medical equipment maintenance services market. Exhaustive secondary research was done to collect information on the market, its peer markets, and its parent market. The next step was to validate these findings, assumptions, and sizing with industry experts across the value chain through primary research. Both top-down and bottom-up approaches were employed to estimate the complete market size. Thereafter, market breakdown and data triangulation were used to estimate the market size of segments and subsegments. Secondary research was mainly used to identify and collect information for the extensive, technical, market-oriented, and commercial study of the medical equipment maintenance market. These sources were also used to obtain key information about major players, market classification, and segmentation according to industry trends, regional/country-level markets, market developments, and technology perspectives. Maintenance & repair revenue generated by leading players has been determined through primary and secondary research. To define, describe, and forecast the global market on the basis of device type, service type, service provider, end user, and region. 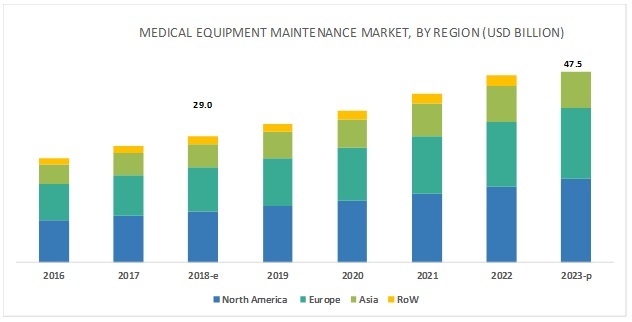 The medical equipment maintenance market is expected to reach USD 47.4 billion by 2023 from USD 28.9 billion in 2018, at a CAGR of 10.4% during the forecast period. Factors such as the rising focus on preventive medical equipment maintenance, adoption of innovative funding mechanism, growth in associated equipment markets, and the purchase of refurbished medical equipment are expected to drive the growth of the market. On the basis of device type, the medical equipment maintenance market is segmented into imaging equipment, endoscopic devices, surgical instruments, electromedical equipment, and other medical equipment. In 2018, the imaging equipment segment is expected to account for the largest share of the global market. This segment is also expected to grow at the highest CAGR during the forecast period. This growth is attributed to the high demand for maintenance services for imaging equipment, due to the high replacement cost and the need for ensuring maximum equipment uptime. The global market, by service type, is segmented into corrective, preventive, and operational maintenance. In 2018, preventive maintenance is expected to account for the largest share of the global market. Technological advancements in medical devices and the consequent need for their preventive maintenance are expected to fuel market growth in this segment. Based on service provider, the medical equipment maintenance market is segmented into original equipment manufacturers (OEMs), independent service organizations (ISOs), and in-house maintenance. In 2018, OEMs are expected to account for the largest share of the global market. The large share of the OEMs segment can primarily be attributed to their service quality, wide geographic presence, and strong technical expertise. On the basis of end user, the global market is segmented into public-sector organizations and private-sector organizations. In 2018, the public-sector organizations segment is expected to account for the largest share of the global market. The dominance of public healthcare in most of the counties and the increase in value-based procurement of medical equipment are the major factors driving the growth of this end-user segment. The market is dominated by North America, followed by Europe, Asia, and RoW. The market in Asia is expected to witness the highest growth during the forecast period. The high growth of the Asian market can be attributed to the increasing patient population, rising awareness on the benefits of early disease diagnosis, increasing public and private funding for the development of healthcare facilities, government initiatives for the modernization of healthcare infrastructure and the provision of quality care, and growing medical tourism in Asian countries. The medical equipment maintenance market is highly fragmented in nature, with several big as well as emerging players. Prominent players in this market include GE Healthcare (US), Siemens Healthineers (Germany), Koninklijke Philips N.V. (Netherlands), Toshiba Medical System Corporation (Japan), FUJIFILM Holdings Corporation (Japan), Carestream Health, Inc. (US), Agfa-Gevaert Group (Belgium), Drägerwerk AG & Co. KGaA (Germany), Hitachi Medical Corporation (Japan), Aramark Services, Inc. (US), Althea Group (Italy), Olympus Corporation (Japan), B. Braun Melsungen AG (Germany), and BC Technical, Inc. (US). In 2018, Koninklijke Philips N.V. (Netherlands) partnered with Kliniken der Stadt Köln (Germany) to provide continuous modernization and maintenance of imaging systems. In 2017, Siemens Healthineers signed an agreement with Kingston Hospital NHS Foundation Trust to provide MES for all medical imaging systems for 10 years. In 2016, Canon, Inc. (Japan) acquired Toshiba Medical Systems Corporation (Japan). What types of annual and multi-year contracts are medical equipment maintenance companies exploring? What are the recent trends affecting original equipment manufacturers and independent service organizations?